Use Carbonation Drops instead of priming sugar when bottling beer, lager or cider. Supplied in a pack of 80. Coopers Carbonation Drops are a convenient way to prime home brew drinks after bottling to aid the start of secondary fermentation. Carbonation drops can be used in any style of beer, lager stout or cider. Although the dosage is based on the Australian sized 375 or 750ml bottles, you can use them in any size bottle. If using a 1 litre bottles we would suggest using 2 per bottle. If using a 500ml bottle we would suggest using 1 per bottle for bitter and 2 per bottle for lager and cider. St. Peter's Ruby Red Ale has won a silver medal in the SIBA East Anglia beer festival. The 4.3% abv ale collected a Silver Medal in the Bitter category. St. Peter's Hall is near Bungay in Suffolk and dates from around 1280. It is the centrepiece of the St. Peter's Brewery site. In 1539 the east wing was added using materials from the nearby Flixton nunnery which was one of a dozen monastic houses given to Cardinal Wolsey by King Henry VIII to finance the building of a schoolhouse in Ipswich, Suffolk's county town. Then, as today, Suffolk barley was carefully malted to brew beers and ales and that tradition lives on today at St. Peter's Brewery. Showing 2 of our total 19 reviews, with an average rating of 5 stars. 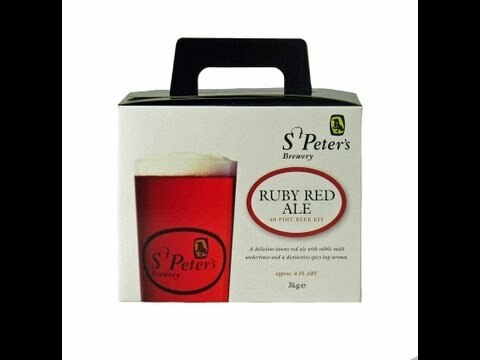 Read all 19 reviews for St Peters Red Ruby Ale Beer Kit. Always a good pint and a really good, satisfying brew! Very happy with this. Tried a bottle after only 1 1/2 and amazingly was already really good.